The success of your logistics outsourcing relationships depends on good 3PL management. That’s right, the things YOU, as the shipper, do or don’t do directly impact 3PL performance and the return you realize on outsourcing relationships. Several studies, including the annual State of Logistics Outsourcing study, have found that the best relationships are ones where there is a healthy trust and respect and a mutual commitment to value creation for both parties. 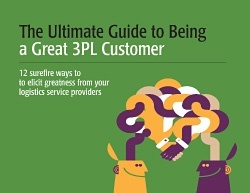 Here are a few suggestions for getting the most from your 3PL relationships. 3PLs depend on data to accurately assess the logistics challenge and price the business. Unfortunately, many proposal requests lack the necessary operational detail to accurately price the business and determine the impact of recommended changes. Regardless of the time pressures you may be under, if you have not crunched the data it’s best to delay the proposal request until you have. Once you’ve selected the right partner, it’s vital to structure the contract and the relationship to create a foundation for success. Leave any of these things unclear and you open the door to billing disputes and debates about services – absolute relationship killers. Another sound 3PL management practice is to assign the right resources to manage the relationship. One of the biggest reasons that outsourcing relationships fail (the biggest reason according to some studies) is a failure on the part of the outsourcing party to assign proper resources to manage the partner. While logistics outsourcing relieves you of certain day-to-day logistics execution tasks, it actually adds management requirements in other areas. To get the most from your 3PL, you must empower them and give them the context they need to contribute strategic thinking. That means sharing long-term business strategies. Sure this requires a high degree of trust, but once shared this information can trigger insights and suggestions that can drive breakthrough performance. These strategic ideas have the potential to deliver far more financial impact than an incremental percentage point improvement on a particular operational metric. For larger companies with numerous 3PL partners, it’s becoming increasingly common for the shipper to convene a meeting that brings all partners together to share ideas and best practices that could be implemented across the entire network. While some 3PLs may feel uncomfortable with this, the enlightened ones will see no problem sharing their own client-specific innovations with competitors. It sends a clear message that the interest of the customer comes first.